What is included in the citation? ​Author. Title of source. 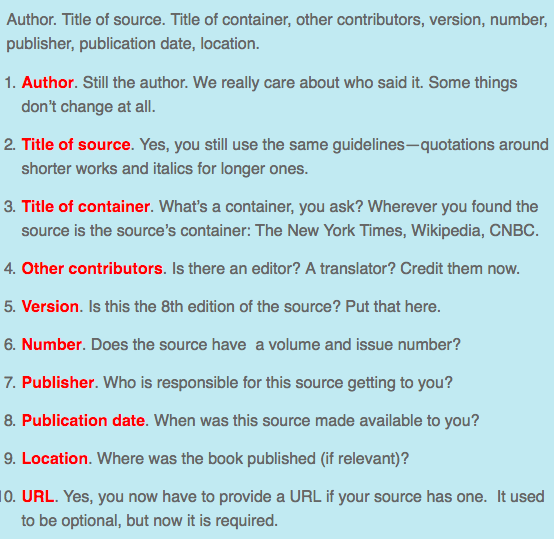 Title of container, other contributors, version, number, publisher, publication date, location. In-text citations can let a reader know which facts were taken from each source. "The eighth-century English historian, Bed tells of how, in AD 449, Hengist and Horsa were invited by the Celtic king Vortigern to help him against his enemies..." (Hogg 1). In his article, "The Distant Shore," Anderson states, "Only about a hundred groups of isolated indigenous people are believed to still exist, with more than half of them living in the wilderness that straddles Peru’s border with Brazil" (42). 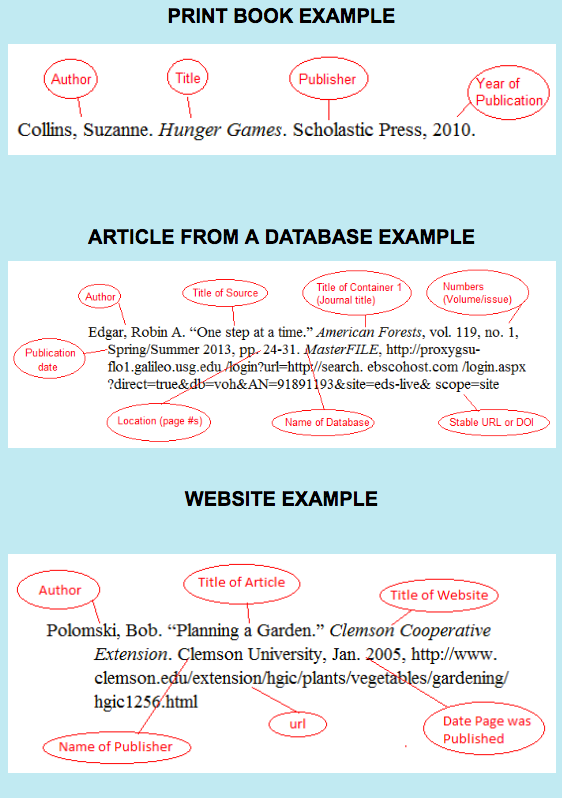 *The author is not added to the in-text citation because he is already mentioned by name in the sentence. When such information is given, it is permissible to not repeat it inside the ( ). The "author" position in an in-text citation should match the first word(s) of the Works Cited list entry to allow readers easy access to full publication information whether that is another person (translator, editor, etc.) or the title of a work. When using a title instead of a person's name, quotation marks or italics should be maintained, even for the abbreviated title. Summarized and paraphrased material must be documented with in-text citations! Citations should be at the end of a sentence to avoid interrupting the flow of ideas. Material synthesized from two sources should include both sources (Kirk 234; Spock 22-4). Page numbers, line numbers and other location information is not invented. If a source doesn't provide it, the writer cannot include it. New in the 8th edition, locations in videos and audio recordings are required and should be given as hours, minutes and seconds (1:23:45-7).